Another year, another Christmas, another round of Christmas adverts to be assessed and pulled apart faster than crackers. The big players have the spot light and the after-match analysis as always but what about the brands that set their sales aside in order to focus on something bigger than themselves. 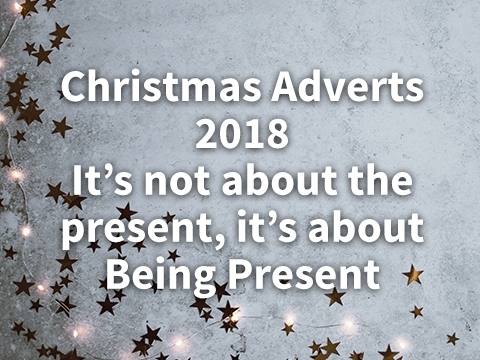 Visa, Pampers, Iceland, BBC, and the independent ‘Love is a gift’ adverts all took an alternative look at the world we live in and used this opportunity to reassess what we should truly focus on at Christmas time. Visa took the opportunity this year to try and drive our internet obsessed country back to the high street. Their rendition of ‘All I want for Christmas is you’ sang buy a variety of local shop owners, all be it a little out of key, reinforced the issue of our suffering highstreets. While the big brands are shouting for attention and elbowing each other to be supermarket and retailer of choice, its refreshing to see Visa taking the time to support the underdogs and remind customers their money would be greatly appreciated by their local butcher, florist or book shop instead. Pampers also took the ‘Christmas Advert hype’ as an opportunity to pay homage, this time to our midwives. In similar fashion to Boots who took inspiration from the Christmas Day experience of a nurse back in 2014, Pampers gave a shout out to those who are never truly off shift, even at Christmas. The different stages of birth shown on our screens, ironically to the song Silent Night, is strangely calming as you watch parents being presented with the best gift they could ask for and midwives on hand and present every step of the way. Iceland’s advert this year focused on the issue of Palm Oil and the destruction its retrieval has on the habitats of animals such as the Orangutan. Since the advert was banned for being ‘too political’ it has naturally ensured that everybody has taken it upon themselves to find and watch the animated tale of the Rang-tan who moves into a girl’s bedroom after its home is destroyed. Some may say this was still a strategic move by Iceland since they are the first big supermarket to tackle this issue and therefore, to support the fight against palm oil, shoppers will turn to them for their Christmas shopping. However, strategic or not, an advert that raises awareness of the damage humans are causing to the natural habitats of animals can only be a good thing. After the sudden increase in awareness of plastic this year, an advert that can boost the awareness of the equally destructive effects of palm oil is welcome. I’d rather a brand drove traffic through awareness of a genuine issue than the life story of Elton John. BBC’s Oneness promo advert is certainly worth a watch. Many adverts in the past have tried to capture the importance of making time for family but this one hits the nail on the head perfectly. Depicting a busy working mum and her teenage son the advert shows the struggle of bonding, communicating and taking time for each other. The advert shows the two struggling to have any sort of relationship until the world physically freezes. Everyone else stops leaving the two of them remaining. Only when everything else literally stops do the two realise what they really need is each other as they ride the dodgems, laugh, chat and spend more time together than they probably have all year. It’s a common complaint that teenagers are hard to buy for, but really what this advert highlights is that maybe your teenager doesn’t want a present, just for you to BE present. And isn’t that exactly what the Christmas break allows? Last but not least the Christmas video made back in 2014 titled ‘Love is a gift’. Although created 4 years previously, this year it has gained the attention is deserves. It was created by British filmmaker Phil Beastall for £50 and has won the hearts of the internet with its hard-hitting and emotional storyline. It depicts a man going about everyday life and crossing days till Christmas off his calendar. On the 25th he goes downstairs and opens a box containing a series of cassette tapes containing messages from his deceased mum, one for each Christmas. The message is thought-provoking and makes you truly consider the importance of people over presents. It’s also proof that you don’t always need a huge budget to make an impact. Consumers are responding less and less to ‘sales messages’ making the creative challenge of 2019 subtle and indirect promotions. Maybe it’s because this wasn’t made for a brand that it manages to communicate this message so succinctly but there is something about it that stays with you enabling you to forget the presents and simple BE present.